The only thing better than a restored silent classic is a restored silent classic that comes totally out of the blue. Today's exciting news is The Ancient Law (1923), or Das Alte Gesetz, in which a master filmmaker used the big-budget resources of Weimar-era German cinema to tell a specifically Jewish story. In a remote corner of Russia, young Baruch (Ernst Deutsch) finds the courage to announce before his elderly father, Rabbi Mayer (Avrom Morewski), that he wishes to become an actor. The unexpected confession stuns the Rabbi and he instantly scolds Baruch, hoping that he would abandon the wild idea and like every other young man in the Jewish village will begin to think about starting a family with a proper girl. But much to the Rabbi's dismay, Baruch quickly gathers his most valuable possessions and leaves. • Two different scores. The first is an ensemble score by Donald Sosin and Alicia Svigals with some wonderful violin and piano solos that imitate traditional Jewish music themes. While viewing the film with it, it definitely feels like there is an authentic connection between the music and the visuals. The second is an orchestral score from French composer Philippe Schoeller and it has a more diverse contemporary harmonic structure. 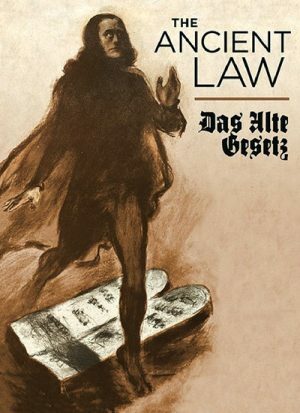 • Der Film Im Film (1923) - presented here is the only surviving excerpt of a documentary on film production in Weimar Germany, featuring the different personalities of several famous directors of the era at work on set including Fritz Lang, Robert Weine, and Ewald Andre Dupont. With music by Donald Sosin. With text German and optional English subtitles. (17 min, 1080p). • Insight Into the Restoration - this documentary highlights some of challenges that the team of experts faced while restoring and reconstructing The Ancient Law. Before-and-after comparisons are provided. With music by Donald Sosin. With text German and optional English subtitles. (17 min, 1080p). • Image Slide Show - a gallery of rare production stills and original archival materials.